The third big screen version of The Blob is on the way, from veteran so-so action director Simon West (Expendables 2, Tomb Raider, The Mechanic and the great Con Air). This time we might just get to meet The Blob’s mom and pop. It’s hard to imagine what The Blob is if it’s not “goo pouring through windows”, since that’s, well, what it does. Any ideas? While this all sounds fine so far, West’s one previous venture into horror, When a Stranger Calls took one of the best opening sequences of the ’70s and turned it into a snorefest. It was a badly misjudged movie, and horror isn’t West’s genre, which is why he’s moving it towards sci-fi. The odds are against its success. Nonetheless Mr. Blobby’s one of my favourite movie monsters, and anything that draws attention to the overlooked 80’s version is a good thing. The Blob pops up out of your sink in 2016. To discover what’s out this year, see our 2015 Horror Movies Guide. My guess is that it will take people over like the thing and morph in some way or other I think they’re probably trying to remove the body dissolving gore to keep the rating down, hence the news that it is going to be more science fiction than horror and the reference to Jurassic Park. Basically I expect it will be a PG cross between The Faculty and Phantoms. But if it doesn’t dissolve people and ooze through windows it isn’t really the Blob. The 88 Blob is a great movie. Can well imagine that. Definitely curious to find out what they’re up to. I liked the 1st Blob as 4the 2nd one? well, it was ok. now, there going 2b a 3rd? I agree with the person, that said, if the Blob don’t ooze, it’s not the Blob. I really like the Steve McQueen movie, never bothered with the remake, probably won’t bother with this either. The 50s-ness is a big part of what I enjoy about the movie. ya, I agree. 50 & 60 movies r “or” were better. they leave it 2the imagination. not like “most” movies 2day. by the way im 58yrs old Friday. It’s hard to beat the original with almost any movie,the only movie that I liked the remake better than the original was Cape Fear.It was way better than the classic with Gregory Peck and Robert Mitchum.Martin Scorsese did an excellent job directing that remake,Nick Nolte and Robert DeNiro were cast brilliantly for the movie,I have it on Blu-ray and still watch it from time to time.I’ll still check out the Blob either way,who knows I might like it better than the original. I dunno, remakes can work but usually they don’t. 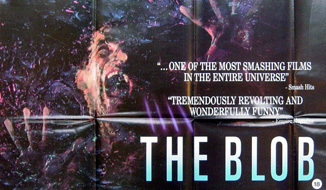 The Blob is a decent remake mainly because it was a showcase for effects. The My Bloody Valentine remake was just a blast on a big screen in 3D and was sufficiently different to the original so that it was not pointless. Cape Fear, I think is nearly as pointless as the Psycho remake. Same score, same camera angles and virtually the same script. I think Scorsese’s reputation artificially boosts its rep and the original, unlike Psycho, was not on every film school syllabus so was rarely seen. I think if you cornered Scorsese he would flat out say it was not as good and that he was just recreating it because Spielberg passed it over. both Cape Fear movies were good. if I had 2choose, ummm I pick the 2nd one. as 4the Psycho movies, the 1st one, of corse. the Birds movies, the 1st one. He asked for an idea for the structure of the blob,how about a a parasitic organism that is pink in color tone,on consumption of biological matter it will try to mimic it as best as is possible.In other words when it consumes a human for example it begins to try and become the human in a crude manner a little like the thing but it could gradually become more evolved and wiser in forming it’s self as it consumes more in generates a better understanding of what it is trying to consume and can mimic it exactly given time,but it can only mimic it in it’s own color tone and for a short period of time,it could also be it needs time to renergize from time to time sort of cocooning it’s self in sewers and so forth basically dark damp areas to keep it’s structure fluid and moisturised,basically it will only ever be gewy and invertebrate in substance but it can shape it’s self at will once it consumes enough but after a time lapse it must cocoon it’s self to rejuvinate.An attack scene might be for Eg.in one of the scenes it half consume a person and it begins to then project half a persons body structure within it’s central body, which is like a torso in the middle but pertruding limbs are emerging out of it gradually as it consumes more of the original matter.It could also at times become semi-human looking in posture and shape lurking in alley’s and dark places,personally i’d also have it mimic the voice of a human crudely,an eg.it hangs out in an alley and when a person becomes investigative of it saying help me it could attack by stretching to reach them as they get closer and pulling them in or by lifting them by their head when they get in close enough proximity from it,it should be true to the original idea of a highly concentrated acidic style killing mechanism though.It could be partly biological and partly unknown element in nature from a scientific standpoint,i’d keep it as it arrives as a solid shard of rock like a meteor and once it hit’s down in a chicken coop or pig pen it consumes a chiocken and the farmer who investigates it as it sounds off to the other chickens in sound,but what ever matter it touches/touches it consumes it and this allows it to then move on to continue this until cocoon time is due again. The 80’s film while creative fx, ain’t that great really dude. Government created bacteria . . . lame. The 50’s original had a much better story and premise. Hopefully they nab a few fun tid-bits from the original movie. But both films in the franchise are fun though. Hope they capture that spirit. I agree it shouldn’t have been government-made, but that background barely had an impact on the way it played out, it could easily have been from outer space just by changing a couple of lines. i would like see this remake be both super scary and intelligent and deliver beyond our wildest dreams in the creativity department.